Well I’ve finally done it, I’ve gone and made my new website, something I’ve wanted to do for quite a while now. I’ve gone with wordpress for the whole website to start with and I still need to tweek a few things, add a photo here and a description there. The gallery is a temporary one too, I have a big plans for that. I just need to work out exactly how I going to do it! 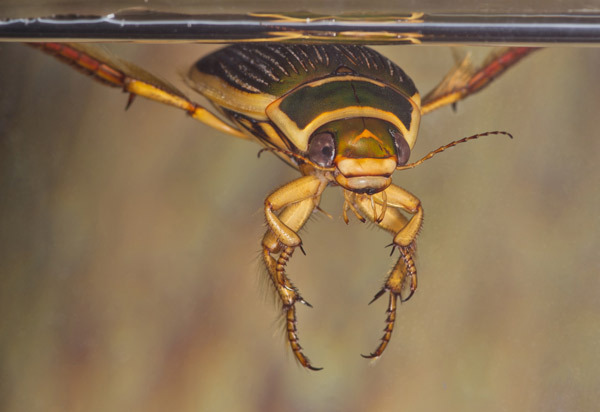 Anyway this is my first post so I thought I’d start as I mean to go on, with a photo of a creature from a pond: a diving beetle. This particualr one is not the great diving beetle Dyticus marginalis but another species known as ‘the wasp’ Dytiscus circumflexus, named after the yellow and black bands on its underside. The deep groves on the elytra (wing cases) show that it is a female. So welcome to the blog and website – hope to see you again! Great shot to open with, and good luck with the new site. It looks good! Yes, good luck with the new site and don’t forget to leave the link around on the old one so everyone gets to see all the fab pics!